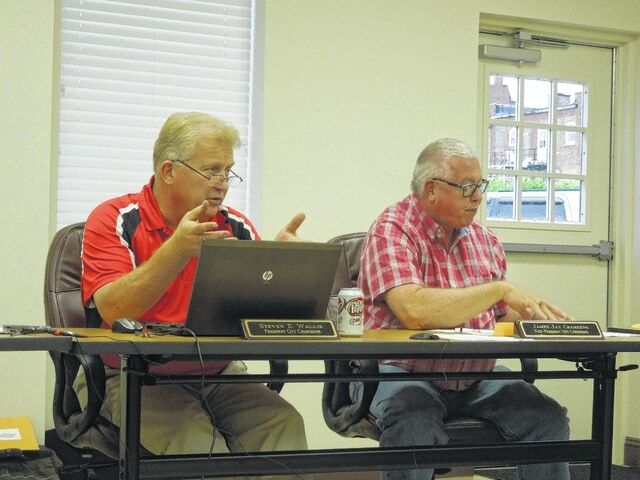 GALLIPOLIS — Gallipolis City Commission conducted its first reading of proposed changes to city ordinances involving golf carts on public streets, their speed and movement range limitations. “What we have now is an ordinance that says a golf cart is a motor vehicle that has not less than three wheels in contact with the ground, an unladen weight of less than 1,800 pounds and that is designed to be and is operated at not more than 25 mph. What I changed (his proposal) it to was that ‘It was designed to be and is capable of being operated of speeds up to 40 mph,’” City Solicitor Adam Salisbury said. Commissioner Matt Johnson stated he had done some research on golf carts and of the models he noticed vehicles “from the factory” were generally not designed to go faster than 25 mph. He did admit that it was possible for such vehicles to be modified with different engines. He differentiated between electric and gas-powered vehicles, saying gas-powered vehicles would be easier to modify but it was not outside of the realm of possibility to modify an electric golf cart. Salisbury asked him if he felt that the language involving speed limitations needed removing. “I think if you’re talking about opening golf carts into 35 mph zones, you would have to. But at the same time, they shouldn’t ever get to 35 mph,” Johnson said. Stephen Wallis noted that it may be possible to remove the 40 mph stipulation from the legislation and embark an education program for the public in good-natured golf cart use and knowing the speed areas of which their vehicle is capable of maintaining a reasonable speed. Chief Clint Patterson with the Gallipolis Police Department noted he had no way of testing how fast a golf cart could move without personally using the vehicle. Wallis said people make “conscious decisions” in their driving every day, be it a car or something else. He noted some cars will travel 25 mph in 40 mph zones. The words in the proposed amended ordinance were struck using the language involving speed. The amendment then stated effectively that golf carts could be taken anywhere within the city limits. The commission felt that operating under the idea that “judgement” is something that cannot be legislated, hoping that individuals driving golf carts will be reasonable in their use in traffic. Patterson said during the meeting that golf carts would still be treated as any other vehicle and their unlawful use could result in legal action. The commission also moved to clarify some wording in the law regarding inspection of golf carts by city officials before they could be approved for operation within the city. Six-passenger vehicles were moved to be allowed instead of just four-passenger vehicles. Commission approved all amendments in their first reading. The ordinances will be discussed again in the future. City officials noted golf cart drivers should be aware of the Galllipolis City Limit boundaries. Gallipolis City Comission President Stephen Wallis (left), discusses potential filing of eminent domain proceedings on another dilapidated property on Second Avenue with City Solicitor Adam Salisbury. Commission member Jay Cremeans (right) listens. http://aimmedianetwork.com/wp-content/uploads/sites/42/2015/07/web1_DSCN2628.jpgGallipolis City Comission President Stephen Wallis (left), discusses potential filing of eminent domain proceedings on another dilapidated property on Second Avenue with City Solicitor Adam Salisbury. Commission member Jay Cremeans (right) listens.